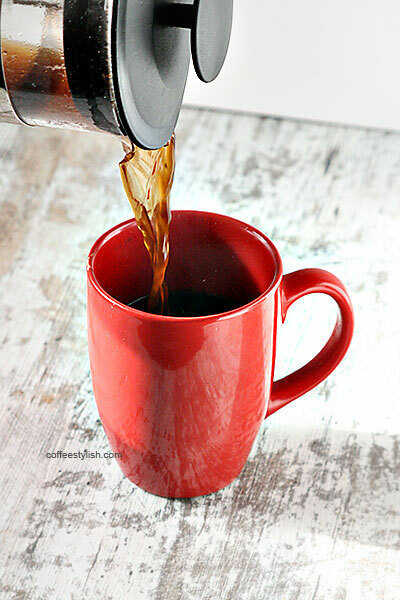 The French press is the simplest way of brewing a great cup of coffee at home. You place coarsely ground coffee into the press, pour in some boiled water, stir and wait. After 4 minutes you press the plunger and it’s ready for serving! 1. Measure out the amount of coffee you would like to use. For two cups I like to use 4 tablespoons coarsely ground coffee + 16 oz water. For a full 34 oz press, I use 8 tablespoons coffee + 32 ounces water. 2. Rinse your empty French press with hot water to warm up the press and add coffee to the press. 3. Bring water to a boil, remove from heat and wait for few seconds. Start the timer (you can use the timer on your phone – no need to buy a special one) and pour the hot water just off the boil into your brewer. 4. Give the coffee a stir with a spoon, making sure all the coffee is saturated. Allow the coffee to brew for 4 minutes. 5. At 3:50 put the plunger on and gently press all the way down at 4:00. 6. Serve immediately. If you’re brewing several cups, transfer coffee into a different carafe to avoid over-extraction. Don’t let the coffee just sit in the press. Use 2 tablespoons of coffee per 8 ounces of water. This ratio makes really good, strong cup of coffee. If you don’t like your coffee too strong, you can use less coffee – maybe 1 1/2 tablespoon of coffee per 8 ounces of water. Feel free to adjust the ratio to your own liking. Compared to pour over method, French press coffee can be bitter. If you like the method but you don’t like the bitter aftertaste, choose light to medium roast coffee, and avoid dark roasts. Also, make sure to keep the brewing time in the 4-minute range to prevent over-extraction. I like to rinse the press with hot water to warm it up – this helps keep the brewing temperature steady. French press needs coarser grind than regular drip grind, so the ideal option is to grind coffee at home. The most affordable coffee grinder that does the job well is Hario manual grinder. If you want to invest in a good electric grinder that works well for both espresso and French press, Baratza Encore is a good place to start. Can you use store bought ground coffee in a French press? If you only have store bought ground coffee (drip grind), keep the same coffee to water ratio and decrease brew time. Instead of plunging it at 4 minutes, keep it around 2 – 3 minutes. A finer grind will also leave some sludge at the bottom of the cup. Too fine, espresso grind won’t work for French press. To keep your French press in a good shape, give your press a quick scrub right after brewing is done. Discard the grounds, handwash with mild detergent, and leave it to dry. Be careful, the French press will be hot. You can also let the press cool for 10, 15 minutes before cleaning.